All of us by now, would like to hold on to summer in anyway possible, but with all the kiddies going back to school, dealing with the heavier traffic because of it and well the sun not shining as bright we come to terms with the fact that summer is almost ending. 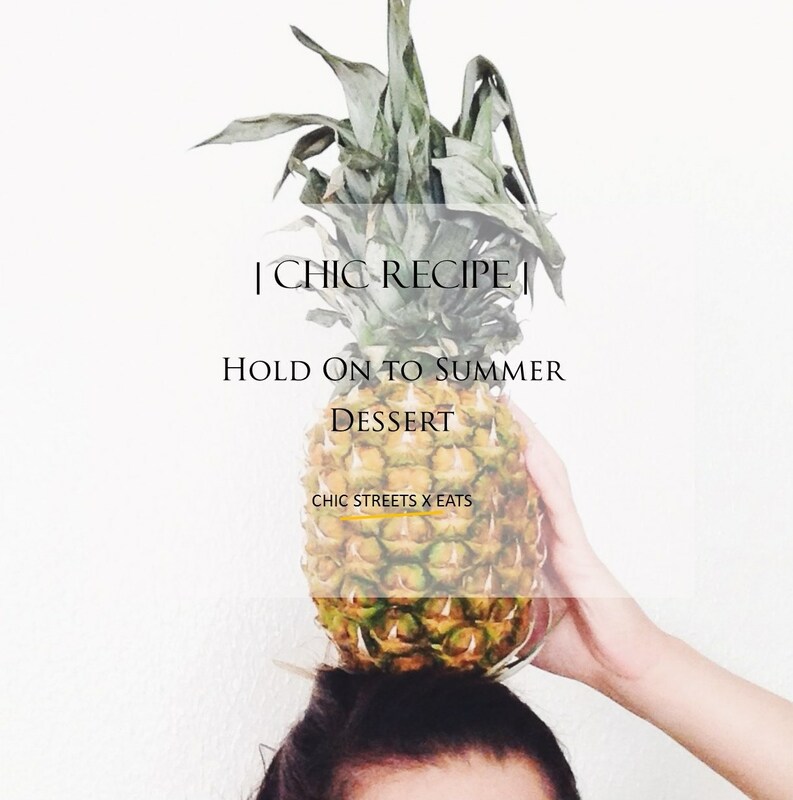 I am here to save the day, with this easy, refreshing and yummy dessert that will have you thinking your in your swimsuit whilst in a lux vacation. | Step 1 | Prepare simple syrup, I did mine with honey instead of sugar and I did not heat it. Simply, but 1/4 cup honey and 1/2 cup water in a bowl and mix, put aside once mixed. | Step 2 | Begin by cutting pineapples in thin slices, there should be 3 slices per plate. | Step 3 | Begin soaking pineapple slices in the simple syrup bowl, soak on each side and place on a plate. Once you have soaked all slices, cover the plate with wrapping and place in fridge. Let slices sit for an hour. | Step 4 | While you wait for the slices to marinate, rinse blueberries and put aside. Cut pomegranate and put aside. | Step 5 | Hour is up, place marinated slices on a skillet and grill for about 30 seconds on each side. Once all slices have been grilled, place them on the serving plate of choice. Garnish with blueberries and pomegranate seeds and coconut gelato or sorbet. You're done and now you can enjoy this delicious summer dessert. Messing with my fur baby Barney Stinson for a cute photo op. Let me know if you try it and what you thought of it. It is hard to find the best movers among the multiple packers and movers as every moving company says they are best. To bring up from such situation Logisticmart help you to connect with the verified and trusted packers movers in India. Explore the right packers and movers which can help you shifting to new location. Oh wow , the food is looking beautiful. I will surely try this , thanks for inspiring us.